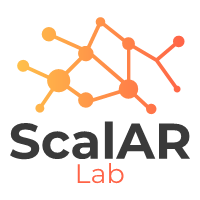 The Scalable Autonomous Robots (ScalAR) Lab is an interdisciplinary lab focused on fundamental research problems in robotics that lie at the intersection of robotics, nonlinear dynamical systems theory, and uncertainty. In our lab, we think of robots as powerful interfaces to the dynamical systems around us. The role of autonomy is to mediate the mismatches in temporal and spatial scales between our thoughts and action and those processes we interact with. We focus on distributed unmanned systems and address the scientific and technological challenges towards long-term operation in dynamic and uncertain environments. Primary focus areas include but are not limited to: adaptive sampling, coordination of heterogeneous robot swarms, harnessing environmental dynamics for planning and control, tracking and estimation of invariant features in nonlinear dynamical systems, understanding the emergence of global patterns from local interactions, and design of novel robotic platforms. Applications include environmental monitoring, mapping and exploration, oceanography, and search and rescue. The lab is under the direction of Prof. M. Ani Hsieh and is a part of the University of Pennsylvania’s GRASP Laboratory. Laboratory members consist of students and post-docs with backgrounds in engineering, computer science, physics, math, and oceanography.